Lions are voracious carnivores; they can require up to seven kilograms (15 lbs) of meat per day. Large mammals, like this African Buffalo, comprise an important part of their diet. In the common, non-taxonomic sense of the term, carnivore is any animal with a diet consisting wholly or mainly of animal matter, whether it comes from animals living (predation) or dead (scavenging). The term is in contrast to herbivore, which refers to animals with a diet wholly or mainly of plant matter, and omnivore, which refers to animals that consume both animal and plant matter. In a similar sense, plants that capture and digest insects are called carnivorous plants, while fungi that capture microscopic animals are often called carnivorous fungi. Carnivores also are known as meat eaters, with meat used in its broadest sense as "animal tissues used for food," including invertebrate tissue, fish, amphibians, reptiles, birds, and so forth. The term carnivore comes from the Latin words carō, meaning "flesh," and vorāre, meaning "to devour," and thus means "to devour flesh." While the term carnivores often is thought of in terms of vertebrates, in a more general sense any animal, including invertebrates, can loosely be considered carnivores if their feeding behavior consists of preying on other animals rather than grazing on plants. There are many predatory invertebrates, for example arthropods such as spiders or mantises and various species of predatory land snails and sea snails. Squids are a well-known carnivore in marine food chains. While the term carnivore is popularly and acceptably used to refer to any meat-eating animal, in taxonomy the name specifically refers to any member of the mammalian order Carnivora, including those that are herbivores. In this article, the term carnivore will be used in the non-taxonomic sense of an animal that consumes animal matter. Carnivores are an essential part of the delicate balance seen in nature. By consuming various animals lower in the food chain, meat-consuming predators, such as wolves and lions, help to maintain acceptable population levels of their prey. Evolutionary biologists consider such predators as key species in the process of natural selection. Meanwhile, meat-consuming scavengers, such as vultures, play an important role in the ecosystem by contributing to the decomposition of dead animal remains. Characteristics commonly associated with carnivores include organs for capturing and disarticulating prey (teeth and claws serve these functions in many vertebrates) and status as a predator. In truth, these assumptions may be misleading, as some carnivores do not hunt and are scavengers (though most hunting carnivores will scavenge when the opportunity exists). Thus, they do not have the characteristics associated with hunting carnivores. Carnivores typically have comparatively short digestive systems relative to those of herbivores as they are not required to break down tough cellulose found in plants. Herbivores like horses and rabbits, which depend on microbial fermentation, tend to have a very large and complex large intestine, while carnivores like cats and dogs tend to have a simple and small large intestine (Bowen 2000). Omnivores like pigs and humans tend to have a substantial large intestine, but smaller and less complex than that of herbivores (Bowen 2000). Insectivores lack a large intestine (Palaeos 2003). In most cases, some plant material is essential for adequate nutrition, particularly with regard to minerals, vitamins, and fiber. Most wild carnivores consume this in the digestive system of their prey. Many carnivores also eat herbivore dung, presumably to obtain essential nutrients that they could not otherwise obtain, since their dentition and digestive system do not permit efficient processing of vegetable matter. In contrast to the tiger, these Emperor penguins show that teeth and claws are not necessary to be a carnivore. They feed on crustaceans, fish, squid, and other small marine life. As with other dietary categories, carnivore (in the general, non-taxonomic sense) delineates a heterogeneous group of animals from many phyla and classes. Piscivore is a term for any carnivores that eat fish primarily or exclusively. Cannibalism refers to a type of carnivory that entails the consumption of members of an organism's own species. Cannibalism includes sexual cannibalism and cannibalistic infanticide. An obligate carnivore ( or true carnivore) is an animal that must eat meat in order to thrive (Syufy 2008). They may eat other foods, such as fruits, honey, grains, and so forth, but meat must be included in their diet. True carnivores lack the physiology required for the efficient digestion of vegetable matter, and, in fact, some carnivorous mammals eat vegetation specifically as an emetic. The domestic cat is a prime example of an obligate carnivore, as are all of the other felids (Pierson 2008). The designation hypercarnivore is used to describe animals that exclusively feed on animal tissue. Additionally, it is used in paleobiology to describe taxa of animals which have an increased slicing component of their dentition relative to the grinding component (Holliday and Steppan 2004). Hypercarnivores present specialized dentition for a meat-only diet. They may consume other products presented to them, especially animal products like eggs and bone marrow or sweet sugary substances like honey and syrup, but, as these items are not essential, they do not consume these on a regular basis. Outside of the animal kingdom, there are several genera containing carnivorous plants and several phyla containing carnivorous fungi. Carnivorous plants are predominantly insectivores, while Carnivorous fungi prey mostly on microscopic invertebrates such as nematodes, amoeba and springtails. Prehistoric mammals of the crown clade Carnivoramorpha (Carnivora and Miacoidea without Creodonta), along with the early Order Creodonta, and some mammals of the even earlier Order Cimolesta, were true carnivores. The earliest carnivorous mammal is considered to be the Cimolestes that existed during the Late Cretaceous and Tertiary in North America about 65 million years ago. Most species of Cimolestes were mouse to rat-sized, but the Late Cretaceous Cimolestes magnus reached the size of a marmot, making it one of the largest Mesozoic mammals known (20 to 60 grams). The cheek teeth combined the functions of piercing, shearing, and grinding, and the molars of Palaeoryctes had extremely high and acute cusps that had little function other than piercing. The dentition of Cimolestes foreshadows the same cutting structures seen in all later carnivores. While the earlier smaller species were insectivores, the later marmot-sized Cimolestes magnus probably took larger prey and were definitely a carnivore to some degree. The cheek teeth of Hyracolestes ermineus (an ermine-like shrew around 40 grams) and Sarcodon pygmaeus ("pygmy flesh tooth," about 75 grams), were common in the Latest Paleocene of Mongolia and China and occupied the small predator niche. The cheek teeth show the same characteristic notches that serve in today's carnivores to hold flesh in place to shear apart with cutting ridges. The theropod dinosaurs such as Tyrannosaurus rex that existed during the late Cretaceous, although not mammals, were "obligate carnivores." 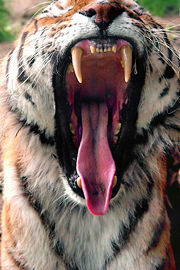 Felines, ranging from domestic cats to lions, tigers, cheetahs, and leopards. Some Canines, such the gray wolf and coyote. Domestic dogs and red foxes are broadly considered carnivorous but are able to digest some vegetable matter making them somewhat omnivorous. The Smithsonian Institution has listed them as carnivores, because of their dental makeup and digestive tract. Some lizards, such as the gila monster and all monitor lizards. Bowen, R. 2000. Gross and microscopic anatomy of the large intestine. Colorado State. Retrieved July 1, 2007. Holliday, J. A., and S. J. Steppan. 2004. Evolution of hypercarnivory: The effect of specialization on morphological and taxonomic diversity. Paleobiology Winter 2004. Retrieved May 5, 2008. Palaeos. 2003. Insectivora. Palaeos. Retrieved July 1, 2007. Pierson, L. A. 2008. Feeding your cat: Know the basics of feline nutrition. Catinfo.org. Retrieved May 5, 2008. Syufy, F. 2008. Definition: Obligate carnivore. Cats.about.com. Retrieved May 5, 2008. This page was last modified on 25 August 2008, at 19:00.